To deliver the best quality linen, we have reliable authentication. Our company has been working to maintain and improve our quality for more than 40 years since its founding. 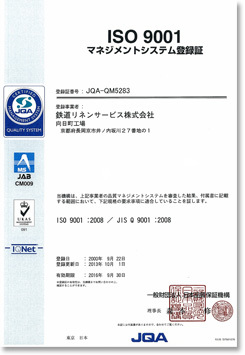 As part of this effort, Mukomachi factory was certified by ISO9001 quality control management in August 2000. 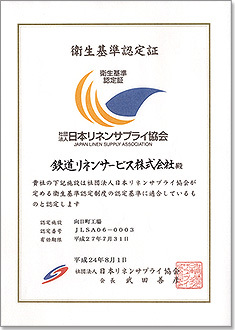 We also acquired regulatory compliance of hygiene standards of Japan Linen Supply Association in 2006. In November 2006, Mukomachi factory has certified and passed the quality standard RAL review of the German Society of Quality Assurance. RAL quality assurance system is the institution of authority to perform the delivery of quality labels and quality assurance of all industry in Germany. Strict numerical criteria are set to work environment quality and linen supplies, and quality certification system is international, not only in Germany, has seen great reliability even in the EU countries. In the German linen industry, to meet strict standards of RAL is a proof of the high quality and reliability. Those standards are essential conditions for transactions. We will strive to maintain the quality level of RAL with this honor. 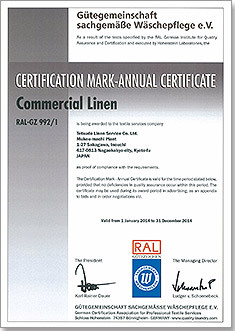 More than ever, we value customer's satisfaction and provide linen supplies with the highest quality.